The UCLH Cancer centre welcomed its first patients on the 2nd April. The newly built cancer centre is equipped with the latest state of art technology to help diagnose and treat cancer. As part of the infrastructure UCLH Cancer centre incorporates 15 Cammax ClearView Self Check-in kiosks and 4 custom built, bespoke Totem kiosks. The Self Check-in software was provided by Cammax’ healthcare partner, InTouch With Health. Mike Sanders, InTouch with Health. 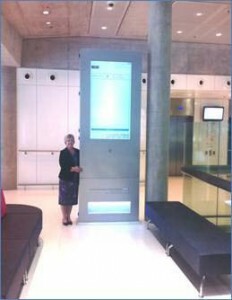 Cammax kiosks provide self-service access to patients across 7 floors on a total of 15 ClearView kiosks, 4 three metre custom built Totem’s incorporating 60” display screens providing clear and accessible signage. As part of the offering the kiosks provide complex Way finding software. This allows patients to navigate through the new building with the aim to increase the amount of patients arriving on time to appointments. The Cancer Centre uses new technology to streamline and improve the patient experience. A new scheduling system will see one person book all the appointments a patient needs in one go – letters from different departments will be a thing of the past. Changing appointments will be simple and straightforward. Patient check-in via self-service kiosks are estimated to take as little as six seconds using a combination of barcode scanners and patient appointment letters, and a maximum of 30 seconds when patients register their arrival using personal information, such as address details or a date-of-birth. In other UK hospitals, similar technology has received a 95 per cent patient uptake rate – reducing administration and the associated cost of the traditional hospital check-in. The new cancer centre is large complex building which patients are free to navigate around. The Centre includes a relaxation garden area for patients to spend time in, therefore signposting and way finding is essential to ensure appointments are not missed. Cammax and its partners developed bespoke Way finding Software which was installed on the kiosks to enable the flow of patients around the centre. Patient appointment letters are printed with barcodes which when scanned at a kiosk will open a user friendly map of their required location along with interactive navigation instructions of how to get to their destination. This ability to navigate freely around the centre will allow patients to be more mobile and feel less restricted in waiting areas. The layout and design of each building is unique. Therefore each Way finding solution deployed at the centre involved developing a digital map of the centre with animated routes to each destination.